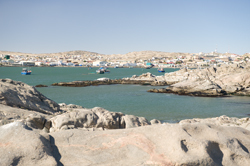 Shark Island Luderitz accommodation guide everything you need to know before visiting Shark Island Luderitz Namibia. Photographs, room types, activities, facilities, location booking information costs rates and prices for your stay at Shark Island Luderitz, read all the accommodation information about Shark Island. 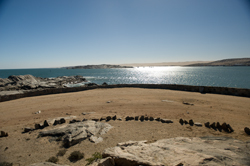 On a peninsula in Lüderitz, Namibia Shark Island offers visitors campsites at budget rates, beautiful scenery and a rich history. 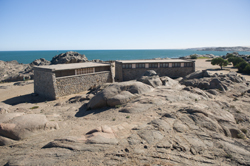 Shark Island Resort was the site of a concentration camp during 1905 to 1907 and harbored Nama and Herero prisoners. Several monuments on the resort close to the main ablution building attest to this troubling time in the resort's history. 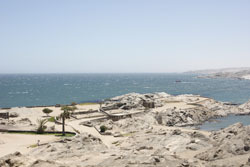 Luderitz Bay is a windy town on Namibia's southern coast with a rich history which signalled the beginning of the diamond trade as well as the early seeds of colonialism. Situated on Shark Peninsula is Shark Island, a site with an excellent view over the bay, town and harbour. Seals and Pelicans are some wildlife species that can be seen frequenting the rocky areas around the site. Shark Island offers accommodation in either a lighthouse or in 3 bungalows. The lighthouse has 2 rooms with 2 beds in each room and 2 bathrooms. It has a fully-equipped kitchen with cutlery / plates, kettle, a fridge and the sitting room has a TV. The 3 standard bungalows have the same self-catering facilities in all the fully-equipped kitchens and each unit has it's own bathroom with toilet / shower. Each campsite has access to a 220V power point providing electricity 24 hours a day. A built-in brick fireplace provides a place to barbeque and taps are provided at regular intervals. One big ablution facility provides showers, toilets and baths to the campers. 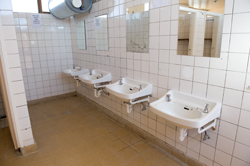 The facilities are old, but spotlessly clean and are serviced daily. A washing-up facility for doing dishes as well as a laundry is provided for inside the building. As the campground is large, additional small ablution facilities are spaced between the campsites. 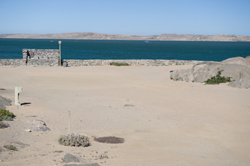 Although crime is not rife in the town of Lüderitz, campers must take note that day visitors are allowed on the resort and campers must make provision for the security of their campsite while they explore the town and surroundings. There is a security guard patrolling the grounds 24 hours a day to assist in keeping the campground safe.